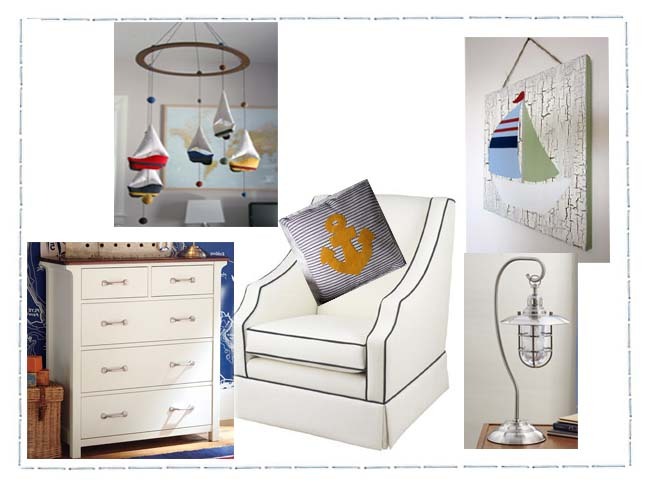 Create a serene and calming nursery for your baby boy with this classic sailboat theme. 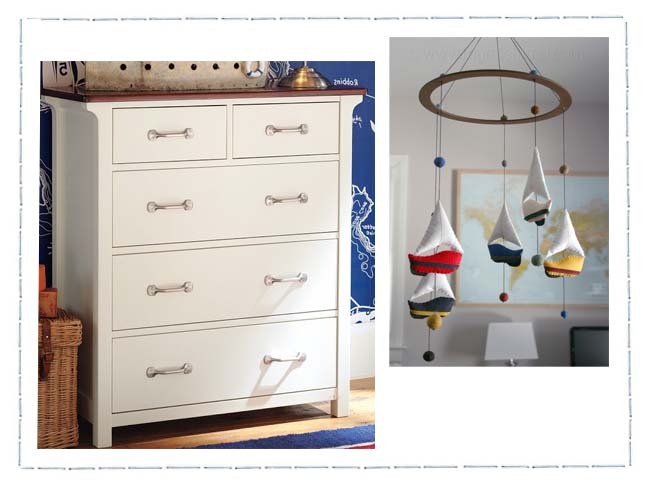 Add pops of color and one-of-a-kind items to make it your own… and a special place for your baby. The Pottery Barn Kids Harper Bedding (sale $19-$154) is a beautiful yet simple set that compliments the sailboat theme nicely. 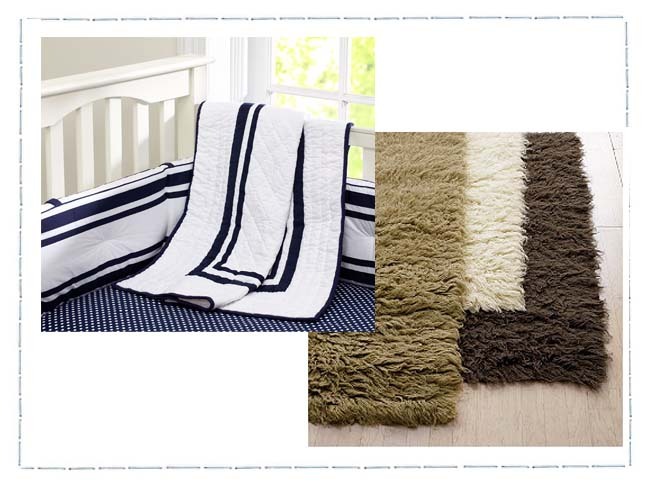 The brown and tan-colored Flokati Rugs ($69- $479) remind me of sandy shores and will provide your nursery floor with a soft place for your tired feet. The Pottery Barn Kids Speedboat II Drawerchest ($699) is a great piece. It’s a subtle compliment to the theme of the room and will grow with your child over the years. This beautiful Sail Away Mobile ($100) is a clean and simple twist to your classic crib mobile and creates a beautiful focal point for baby. The Olio Cohen Glider ($1349) is made of water-resistant, stain-resistant faux leather and has a beautiful piping accent. 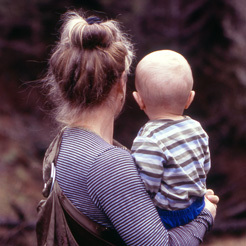 The parallel rocking motion and high back ensure you have a comfortable place to rest with baby. 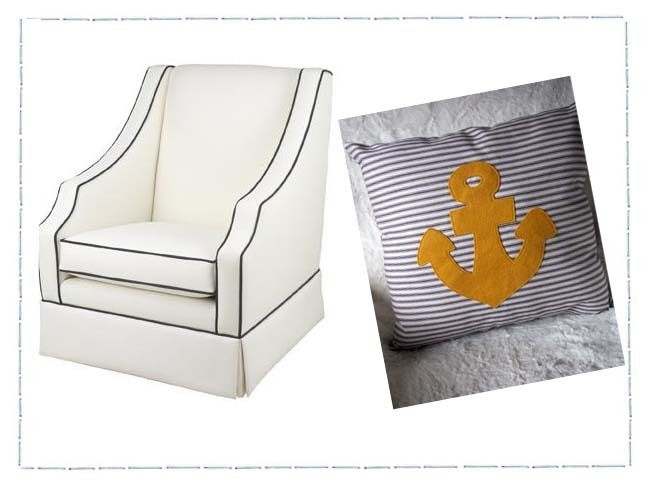 This amazing Gold Anchor Throw Pillow ($30) adds a unique and custom look to your nursery and provides you with some extra (and much-needed) lumbar support while rocking baby. The Fisherman Table Lamp ($72) from Pottery Barn Kids is one of my favorites. It brings a timeless ‘by-the-sea’ look to your nursery and provides just the right amount of light. 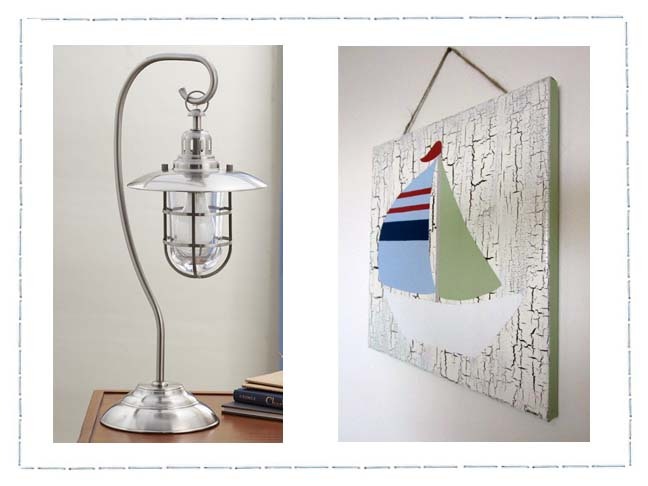 This fun Sailboat Wall Art ($30) is perfect for a sailboat-themed nursery wall.